When twentysomethings Molly Kidd and Ryan Murphy formed a startup company in Seattle three years ago, they agreed that they were perfect for each other—as business partners. Molly made the rules: they will never date each other, they will never talk about their personal lives, they will never visit each other’s homes. Fortunately, they have so much fun spending so much time working together at the office that they barely have time to do or talk about anything else anyway. Now that it’s winter and everyone at their small successful company is overworked and grumpy, Murphy gets this crazy idea that they should all take a work vacation at a resort in Hawaii. Yes, the woman who organizes the workations at this resort happens to be gorgeous, but Murphy believes it will benefit the whole team to have more work-life balance. Molly refuses to admit that she’s intimidated by the thought of the most important guy in her life falling for this perfect lady, so she agrees to the trip despite being equally uncomfortable with the idea of relaxing in a bikini in front of her coworkers. 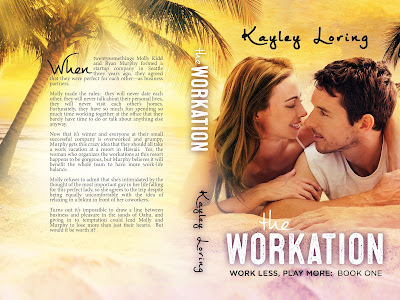 Turns out it’s impossible to draw a line between business and pleasure in the sands of Oahu, and giving in to temptation could lead Molly and Murphy to lose more than just their hearts. But would it be worth it? THE WORKATION is a standalone, the first in the Work Less, Play More series. It’s a friends to lovers romantic comedy that works! When we land, I turn on my phone and receive twenty-seven text messages. One is from Amelia, one is from Molly. I read the one from Molly first, in case there’s some kind of business emergency that came up in the last sixty seconds that I don’t know about. It’s this weird passive-aggressive message about Amelia and tacos and sausages. Now I understand why she never wanted to discuss personal stuff. She’s mean and insane. I look back to her row. She’s pretending to be fast asleep. Or maybe she’s really asleep. But how else would she have sent me a text as soon as we landed? Here’s the text from Amelia: Aloha! Hope you had an amazing flight. Excited to see you and your coworkers when you arrive at the resort! Okay so it’s not flirtatious in any way, but at least it is what it is and I don’t have to question it. I guess I love things with Molly the way they’ve always been and we shouldn’t complicate that. She’s right. I write Amelia back: Aloha! Can’t wait to see you. Boom. Not flirtatious, but straightforward. As it should be. The ding alerts us that we can unfasten our seatbelts. Chuck finally moves his big head so A.J. and I can see out the window, now that there’s not much to see. It’s still magic hour and I can’t wait to get out and feel the warm air. I look back at Molly again. Olive is helping her to stand up while Scooter gets her bag from the overhead bin. She’s staring at me, all smile-y and angelic-looking. Actually she’s a little cross-eyed. She may be drunk. And not actually staring at me. I don’t want to know why it’s so easy for him to diagnose a woman’s high-ness, but I have never seen Molly Kidd under the influence of a drug (as far as I know). I grab my overhead bag, let Chuck and A. J. out, hang back at my seat and wait for her to reach me. Olive is basically propping her up from behind and coaxing her forward. I wait for Molly’s eyes to focus on me. When they do, she smiles so beautifully I almost feel my heart jump out of my chest. I clear my throat. “Hey there, champ. Guess you had a nice flight, huh?” I nod at Olive and take over propping Molly up and moving her forward so we don’t hold up the line of people waiting to disembark. “I had a dream about you…” she says in a sing-song voice. “Ever.” Olive, Scooter and I say it at the same time. Kayley Loring lives in California with her family and loves them so much she even remembers to take a break from writing and reading in order to feed and clean up after them occasionally. When not writing, reading, feeding or cleaning, she binge-watches Netflix and HBO, gardens, goes for hikes and day trips, and takes long walks on the beach while thinking about writing and reading.